The Beachboys continued their fine home form on Tuesday night as a first half treble helped send Hampton & Richmond Borough home with their tails between their legs. 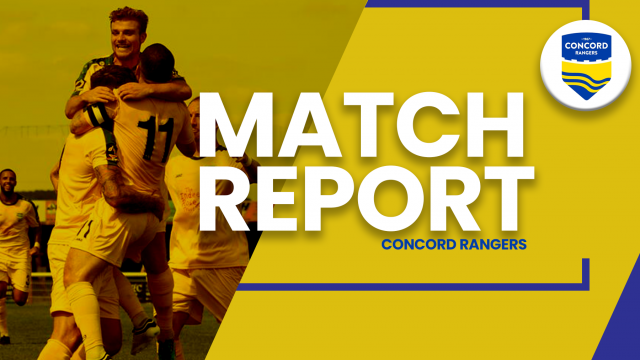 The game started well for the home side, starting to create space down the right through the pace and strength of Liam Nash and Alex Wall respectively, and it didn’t take long for this to pay dividends for Concord Rangers. Nash sped down the right, passing the Beavers number 3 with ease in the process, and squared the ball through to Sam Blackman who curled the ball into the back of the net from just outside the box. Concord continued to dominate the game, and were able to double their lead over the Beavers just 10 minutes later thanks to Yado Mambo bringing down Jack Midson as he burst into the penalty area. The ref was quick to point to the spot, and after some discussions with the Beachboys front-line, Nash stepped up and slammed the ball home past former Concord ‘keeper Tom Lovelock to make it 2-0. It was only then that the visitors started to get back into the game, pushing forward and beginning to create chances, one of which from Ricky Wellard prompted an outstanding save from Sam Beasant, who continues to be a rock in the Beachboys goal this season. After giving away the penalty earlier in the game, Mambo (number 5) was subbed after suffering an injury, bringing another former Beachboy on to the pitch in James Hammond. The Beachboys were also forced into a sub this half, as Frazer Shaw took a knock and was replaced by Aron Pollock. The visitors continued to grow into the game, with chances hitting the post or floating just wide in the following 10 minutes. The Beachboys were dangerous whenever they went forward though, and they made it a 3 goal lead just before the half when they caught the Beavers sleeping at the back. A free kick just outside the area was taken quickly, leaving the Hampton defence stationary and allowing Midson to tap the ball into the net. The second half started with Hampton on the offensive, desperate to get something out of the game, however except for a couple of chances saved with relative ease by Beasant, they were unable to truly threaten the Beachboys goal. Concord had their chances to increase their lead during the second half, with a couple of near misses from Wall and Kyei getting the fans behind the goal excited. The fourth goal did eventually come with the last kick of the game, when a long ball over the top found the workhorse that is Liam Nash who then drove into the box and calmly drilled the ball past Lovelock and into the net. The refereee then called time on the game, which saw Concord Rangers move up to 5th in the league with a trip to Bath City on the way the following Saturday.